Plaid just seems to be the best pattern when you are looking for something rustic, cozy, and stylish. The Buttoned Plaid Cowl adds a nice pop of color to an outfit without being too bulky. I decided it was time to work on a project for the men in my life. I had just finished the Constellation beanies and wanted to make something special for my husband. If you are a fan of plaid, check out the free printable plaid gift tags. You can get more information about them at the end of this post. My husband is not someone who thinks of adding accessories to his outfit. He is all about being practical. Boots, jeans, shirt and he is done. It starting to get cold in the evening and I wanted to give him something he could just throw on to fight off the chill. He loves the buttoned plaid cowl because it is light and warm. Plus it can be styled in so many different ways. This buttoned plaid cowl would make a perfect gift. Like this pattern but not ready to make it now? Now let’s looks at what we will need to make this cowl. First you will need to pick your colors to create a plaid effect. This is really simpler then it looks. Just pick two shades of one color and add either black or white to those colors. You can also pick three shades of one color, but I find it is hard to find a yarn with three perfect variations of one color. So here is some examples for a plaid color combination. I used the blue example in my Plaid Ear Warmer pattern. Other options is to pick two colors then find a third color that is a blend of those two colors. I used this color combination in the skirt of my Simply Fall Baby Dress. The Yellow and Red would blend together to make orange. Just remember that the orange would be your medium color. When referring to the color in the pattern I will be labeling the colors as Light, Medium and Dark. 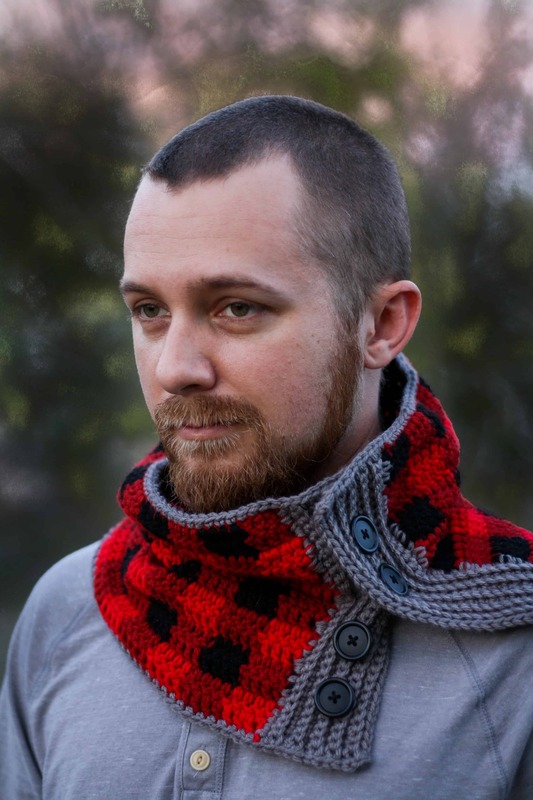 Do you like the Buttoned Plaid Cowl pattern? Check out all my free pattern here or see some of my favorites below. Worsted Weight Yarn in your three plaid colors plus and accent color. Measurements when laid flat and unbuttoned. Ends will over lap by about 2 inches. Finished size – 29 inches long by 8.5 inches wide. I do not count my turning chain as a stitch, and I do not work a stitch into the top of the turning chain. I like to Ch 2 at the beginning of each row instead of ch 3. If you have any trouble creating the plaid pattern, read the pattern then scroll down for a row by row break down of the plaid design using crochet diagrams. You will be working with two colors at once, do not carry the third color throughout the project instead we will be just carrying it up the side of the cowl. It will get crocheted over later when we work Single crochets down the side of the cowl. Note: For Row 2 you will work dark Dc into the dark colored stitches of the previous row and medium color Dc into the medium color stitches of the previous row. R3: Ch2, turn, (Using the lightest color, work one Dc into each of the next 4 stitches, Using the medium color, work one Dc into each of the next 4 stitches) repeat from (to) across. Note: For Row 3 you will work light Dc into the medium colored stitches of the previous row and medium color Dc into the dark color stitches of the previous row. R4: Ch2, turn, (Using the medium color, work one Dc into each of the next 4 stitches, using lights color, work one Dc into each of the next 4 stitches) repeat from (to) across. Note: For Row 4 you will work medium Dc into the medium colored stitches of the previous row and light color Dc into the light color stitches of the previous row. Repeat rows 1-4 three more times. You will have a total of 16 rows. For Row 1 you will Ch2, turn and then work the repeat pattern into the stitches of the previous row instead into chains. Fasten off and weave in your ends. R1: Using your accent color, (I used pewter) Slip stitch to one corner of the cowl, Chain 1 and work 29 sc along the side of your double crochets, over all strands of yarn. R2-5: Ch1, turn, work one Sc in the Back Loop Only of each stitch across. R6: Ch1, turn, (work one Sc in the next 5 stitches, Ch 1, Skip the next stitch) repeat from (to) for a total of 4 times, Sc in the next 5 stitches. R7-11: Ch1, turn, work one Sc in the Back Loop Only of each Stitch across. R2-11: Ch1, turn, work one Sc in the Back Loop Only of each stitch across. Do not fasten off. Ch 1, Work one Sc into the side of each row of Sc. and work one Sc into each stitch along the top (or bottom) of the cowl until you reach the other rows of Sc. Work one Sc into the side of each row of Sc. Ch1 at the corner and in the Back Loop Only, Sc along into each Sc along the side, Ch 1 and work ! Sc into each stitch around the bottom (or top) of the cowl until you reach the side of the Sc rows. Work one Sc into the side of each row of Sc. Fasten off at the corner and weave in your ends. Attach four 1″ buttons to Side 2 of the cowl. Your Buttoned Plaid Cowl is complete! What did you think of the pattern? Let me know in the comments below. Are you going to make a Buttoned Plaid Cowl for someone you love? I would really like to see your finished cowl, take a picture and share it with me on any social media! Just tag me @windingroadcrochet, #windingroadcrochet, or #ourcrochetjourney. Join my Facebook Group and share your creation with the community at Our Crochet Journey Facebook Group! Are you a fan of plaid? Grab my plaid printable gift tags and sign up for my newsletter while you are at it. I like this pattern. Thank you for sharing your patterns with me. I’ve never done a plaid project yet. So just maybe this is the one.